The Lilypad: What happened at Leaps of Knowledge with St Anne’s College, University of Oxford? What happened at Leaps of Knowledge with St Anne’s College, University of Oxford? The 25th of July 2015 was a fast-paced and inspiring day. 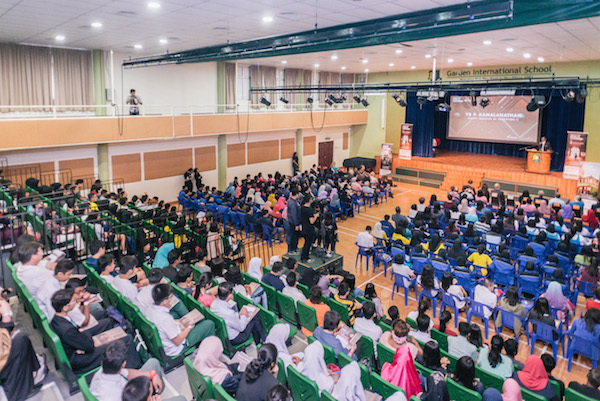 The Leaps of Knowledge Conference with St Anne’s College, University of Oxford took place at Garden International School Mont Kiara, and we had the opportunity to meet five hundred of you! It was an amazing chance for us to have been able to engage with the professors of the University of Oxford, and to see you interact with them too. The day started off bright and early, and it was so exciting see so many of you ready to seize the day! 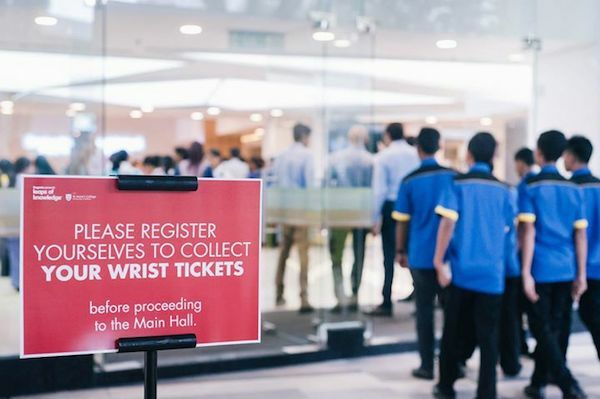 Students getting their wrist tickets for the morning's sessions. We couldn't wait for the subject talks to start! 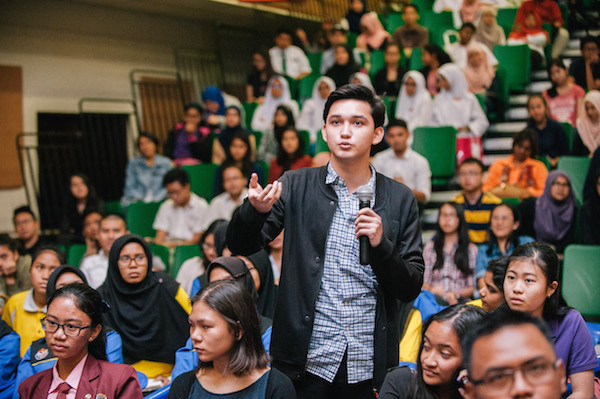 Being brave and bold isn't a problem for Malaysian students! 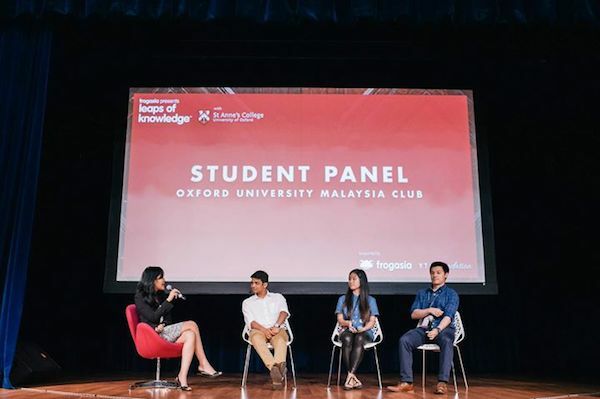 The Oxford University Malaysian Club (OUMC) shared how each of them came from different educational backgrounds. From international schools to national schools, it is testament to the fact that an education at the University of Oxford, a world class university, is possible for those with determination. The OUMC student panel also spoke on what it was like to apply to and experience studying at one of the most esteemed universities in the world. “Choose something you’re really passionate about.” We agree! Also, there were some pretty amazing things taking place at the exhibition hall! 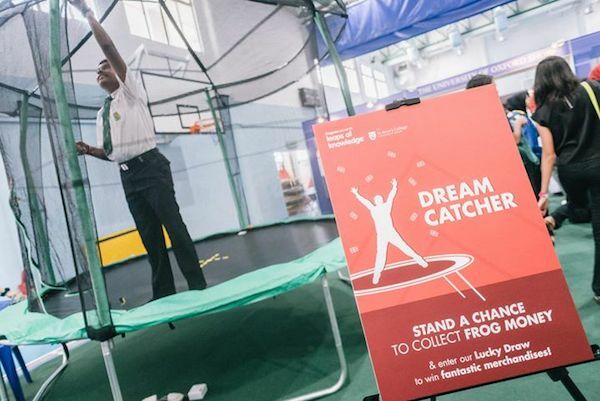 A ten-foot trampoline called the Dreamcatcher and a replica of the Junior Common Room found in the University of Oxford formed part of the exhibition. 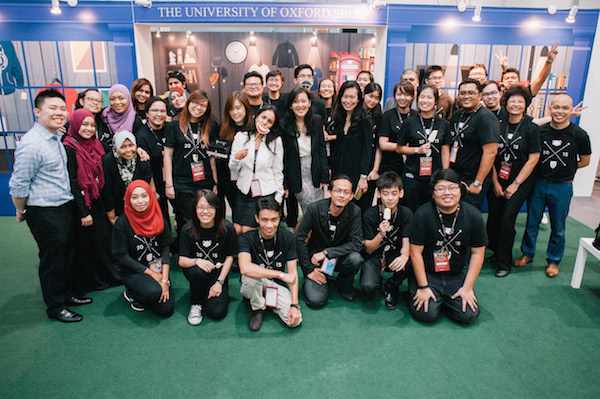 There were also interactive Frog VLE demonstrations and a replica of the University of Oxford Shop where FrogAsia T-shirts, button badges, and more could be found! At the OUMC booth, the members of the OUMC played interactive games and chatted with students. Prof. Chard and Prof. Speight then took the stage to explain what goes on during the University of Oxford’s admissions process. 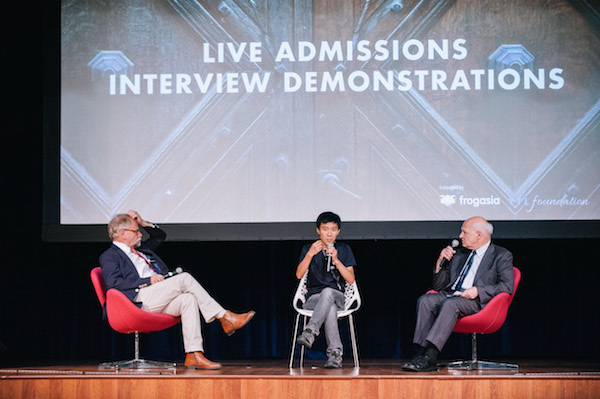 Prof. Speight reminded us that at the end of the day, “it’s not the buildings, it’s the people.” Following that, we had two live admissions interview demonstrations, where two current Oxonians demonstrated how an Oxford interview takes place. It was a showcase of the skill of critical thinking, as the professors wanted to assess if the interviewee is able to think beyond what is taught within the four walls of a classroom. The questions sounded simple, but the answers might surprise you! Participants shared their opinions during the session. It was great to know that so many students wanted to pursue a higher education! 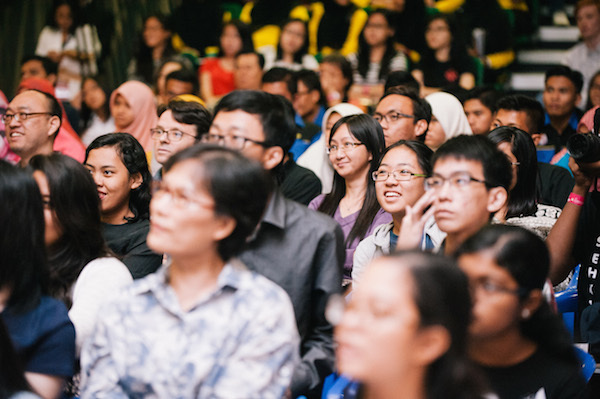 We look forward to seeing you all again at the next Leaps of Knowledge Conference on the 31st of October 2015! We’ll be having Cathy Davidson as our keynote speaker. She is a leading innovator of new ideas and methods for learning and professional development in the school, in the workplace, and in general everyday life, so remember to block out your calendars for it! We'll see you again soon at Leaps of Knowledge Conference 2015! Register here for a 50% early bird discount!